Getting to the truth of what is or is not good for our dogs. As many will understand so very often I am acting more as a messenger than an authoritative source in this place. It is very difficult for me, almost impossible indeed, for me to verify the validity of what is posted here. On January 11th, I published a guest post from Kathreen Miller. Her article was called Is Organic Food Really Good For Your Dog To Eat? 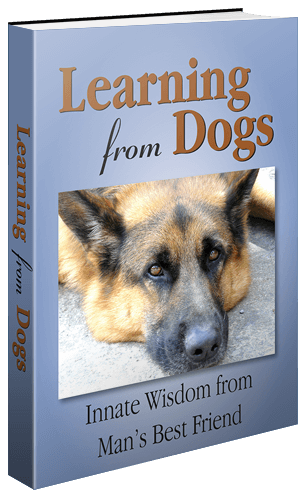 Yesterday, local good friend and neighbour, Jim Goodbrod, sent me an email pointing out a number of weaknesses in Kathreen’s article and giving me permission to republish what he wrote as a post on Learning from Dogs. Jim is an experienced Doctor of Veterinary Medicine (DVM) and has frequently advised us, both professionally and informally, about our own dogs and cats. We trust him fully. Jim attends a couple of local vet clinics including Lincoln Road Veterinary Clinic in Grants Pass to where we take our pets when required. Dr. Jim seeing a patient at Lincoln Road Vet. Here is Jim’s update published with his kind permission and unchanged by me apart from some minor formatting amendments including italicising some phrases. Regarding your post of 1-11-18, a guest post by Kathreen Miller concerning canine diet, I feel the need (justified or not) to clarify a few points. She seems to be a big proponent of “organic diets” and lest your readers be misled, I think we need to define what is meant by “organic”. The legal definition of “organic” is codified by the USDA National Organic Program (NOP) in 7 CFR 205. Pet foods and pet treats must comply with these regulations or they may not legally use the word “organic” on the label. If you read these regulations, you will find that “organic” refers only to the handling and processing of ingredients and products. These regulations cover: ingredient sourcing, ingredient handling, manufacturing, and labeling & certification of products wanting to use the word “organic” in their labeling. However, these rules are not considered by NOP as a means to ensure safer, healthier, or more nutritious foods. In fact, there is no regulatory distinction in the tolerable levels of pesticides, drugs, or other residues allowed in organic vs conventional products (even though lower residues may in fact be a result). Rather, the “organic” label is viewed as a confirmation of the organic production process, and the purchaser is left to his or her own determination as to whether the costs merit the perceived benefits. The bottom line is that “organic” refers to the processing of a product, and makes no guarantees as to the quality or digestibility of ingredients, safety, nutritional value or health benefits of the product. A savvy pet owner, in order to ensure her dog’s optimal nutritional health, would be better advised to follow guidelines outlined by WSAVA or AAHA (or other reputable source) rather than to reflexively reach for the dog food that says “organic” on the label. The “organic” label does not necessarily mean a diet is good or bad, but it has nothing to do with the nutritional adequacy of the diet and hence your dog’s health. Another point: Kathreen seems to buy into the popular myth that plant-based ingredients (like corn) are poorly digested fillers that provide little nutritional value and can cause allergies. Corn provides a good source of carbohydrates, essential amino acids, protein, and essential fatty acids in the diets of dogs and cats. It is highly digestible and is not a common cause of allergies. It is actually a very good nutrient as an ingredient in pet food. My last point is regarding the product “Pet Bounce” that Kathreen endorses as a treatment for arthritic pain in dogs. This product is labelled as homeopathic and as such is nothing more than a placebo. Anyone familiar with homeopathic nomenclature knows that, for example, the Apis mellifica 30C designation means that this particular herb is diluted in water 1 to or (that’s 1 followed by 60 zeroes!). To put it into perspective, that’s equivalent to 1 molecule of this substance in a sphere of water 90 million miles in diameter (approximately the distance of the earth to the sun). That’s a 30C dilution. At a 200C dilution, the treating substance is diluted more than the total number of atoms in the known universe! Regardless of any medicinal properties these herbs may have, they are so fantastically diluted that there is not one molecule present in the final solution. I defy any reasonable person to tell me that this so-called remedy is effective to treat anything and consists of anything more than a water placebo. My problem with this kind of snake oil is that well-meaning pet owners waste their money (~$50.00 per bottle!) on this useless product, believing all the hype and thinking that they are improving the quality of their dog’s life, meanwhile squandering the opportunity to actually help their dog with an effective and evidence-based treatment. Kathreen seems to be a nice and well-intentioned woman, but I don’t know what qualifies her as a “pet health expert”, other than her own opinion. According to her profile (from your blog) she lives in Chicago with her daughter and dog “Buddy” and listens to music, watches TV, and travels. That’s it? Nothing more?? Again, your readers, Paul, would be well advised to visit professional veterinary nutrition websites (and there are dozens of them) for their veterinary nutritional information. I know you will join me in thanking Jim for spending the time in writing this update. Thanks for the clarification, Paul. These points are good to know particularly about organic food. Good stuff, Paul. On behalf of my pup, thanks for your post. Give your lovely pup a cuddle from Jeannie and me! Thank you Paul for the update and more information from your Veterinary friend. Thanks for this update Paul – you have great integrity. I too had my doubts about what was written by Kathreen, especially the bit about homeopathic remedies ( although I know the Royal family believe in them). I was a bit surprised to learn that in the US there is no regulatory distinction in the tolerable amounts of pesticides and other residues that are allowed to be in foodstuffs labelled ‘organic’ ( or in the case of Australia – ‘certified organic’). We certainly have those requirements here in Australia. Otherwise, what’s the point of eating it ? There is so much competing information on the Internet these days about so many things, often from competing reputable individuals or groups and it’s easy to get confused. An example is the whole debate about high fat/ low carb (grain) diets for humans. This has even extended to the diet of dogs, with some veterinarians strongly advocating a ‘natural’ canine diet comprising raw meats and organs, bones, eggs, a small amount of vegetables and fruit but minimal grains, ie no high carbohydrate kibble. Margaret, a wonderful response from you. When it comes to cats and dogs feel free to raise a query with me. For I will pass it on to Dr. Jim. He is very committed to sweeping away false notions about looking after our animals. Very good advice from Jim! Nice to read about this topic viewed by a vet, Paul. I don’t fully agree with him about homeopathic medicine for animals, some of them do work well. In Europe, we have other rules for being allowed to call food organic. It needs to be produced organic without poison at all. Ideally there should be conformity around the world about the exact definition of what organic means. Won’t hold my breath on that happening! Oh gosh, well. I was with the vet on understanding the organic issue. But to dismiss homeopathy as placebos is to dismiss a well-respected form of medicine. I have used homeopathic remedies on our pets – prescribed by our holistic vet here or not – for many years. The anxiety remedy absolutely calmed our Lab and hound when they were freaking out with fireworks. Arnica was used in the 20’s for trauma by my totally Western medically-oriented father (!) And we use it still. It will almost totally reduce swelling and bruising if used right away after an injury. And it surely works on our dogs! So please do your research and experiment, folks. Don’t take one person’s word for it. There are many holistic vets and physicians who augment their practice with homeopathic medicines. Aloha, Paul. Bela, let me raise this with Jim over the weekend. Thanks for that feedback.